Tallangatta and Kiewa Veterinary Clinics offer routine breeding services for our equine community. Drs Joe and Meika Skuse, have brought with them experience in the horse breeding field, and are keen to expand the services on offer. Their experience in northern NSW involved a wide array of services. From ponies to standardbreds to stockhorses; routine pregnancy tests to caslick surgeries to artificial insemination (AI). Meika has also undertaken further training in advanced equine reproduction, with specialist Dr John Chopin from the Hunter Valley. If you would like to enquire about our breeding services, please don’t hesitate to call us. We are available and happy to help you plan your options. Pre breeding checks can be useful in determining if your mare is cycling normally, identify any potential problems and help determine her breeding potential. It is a good time to assess her general and reproductive health, discuss vaccinations, worming, diet and dental history. It is particularly useful in maiden mares and the aged mare. 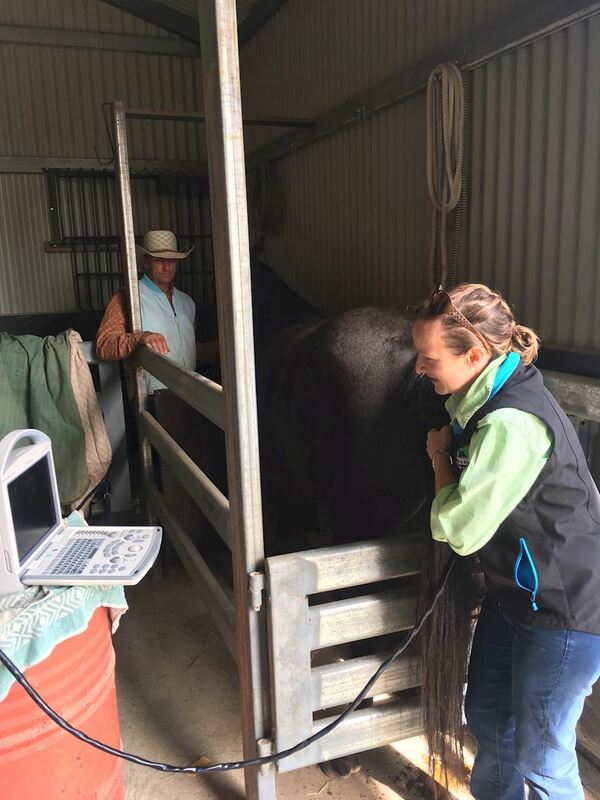 Follicle testing is planned ultrasound scanning to assess what stage your mare is in of the (average) 21 day cycle. This is useful in determining the optimal time for service; which allows for walk-on-walk-off service, artificial insemination, or just to reduce number of serves, or days on agistment with the stallion. At this time, your veterinarian may advise the use of drugs to “short cycle”, “induce” the impending ovulation or to aid in “cleaning” post service. Preg testing can be done from 16 days post service. Commonly we advise an early preg test in this 16-20 day window, to allow reduction of twins safely if present, and to allow enough time for re-breeding if she is negative at this preg test. A second preg test is routinely performed at 45 days, as this is the time that the placenta has taken over the hormone control responsible for pregnancy and is the industry standard for a “safe” positive pregnancy. a solid tailgate which is not too high- there needs to be a distance of about 30cm from vets arm in the mare to tailgate! Our veterinarians also attend many foalings throughout the year. If you have a foaling due, please let the staff know so the vet on duty can be pre-warned. we need to get to foalings as soon as possible, so please let us know straight away if you think something is amiss.